29 October 2012: Good post on the Guardian’s website about the emergence of community-led energy schemes over the past year and – worryingly – the potential negative impacts that might arise out of the Government’s forthcoming proposals for the Electricity Market Reform (EMR) in the Energy Bill on smaller scale generators. Some of these issues are picked up in a useful briefing by the Renewable Energy Association (REA) ‘ 10 actions needed to make EMR work for renewable power‘. It’s also stated that the analysis will inform Government’s forthcoming Heat Strategy scheduled for release in March 2013. October 2012: Just posted on the GLA website is a Mayoral approval form for the current round of RE:NEW 2012/13 (also called RE:NEW II). The approval form is signed and dated by the Mayor back in April (pre-election) but has only been posted on the GLA website on 16 October. It provides for £3m to be allocated to retrofit a further 24,000 homes (on top of the 64,000 homes treated under RE:NEW I) by the end of this calendar year. An additional £300,000 is being spent on stimulating early Green Deal uptake with a delivery agent procured (using the RE:NEW framework) to deliver RE:NEW Green Deal to residents in selected areas. Further information on RE:NEW targets is available in the following post. London’s suburbs do the best in relation to PVs installed with Waltham Forest having the highest number of installs of all London boroughs (701); then Bromley (666), Croydon (525) and Havering (440). Unfortunately installed capacity (ie kWe of generation) by local authority/constituency is not available – which would be a more helpful metric (it is included available on a per installation basis in Ofgem’s comprehensive FIT spreadsheet (370k+ entries) – the latest of which was published a few weeks ago – and which Energy for London is currently going through and will report on shortly). In addition to the direct link here the spreadsheet can also be downloaded from the following DECC FITs webpage (the file is called ‘Sub-regional Feed-in Tariffs confirmed on the CFR statistics‘). How can existing suburban neighbourhoods be best adapted to reduce further impacts of climate change? It is in suburbs that the majority of the population will be affected by climate change. The impacts of these changes will be felt by people, in terms of, for example, increased heat stress and reduced comfort during hot spells,restrictions on water use, reduced air quality, and stress and costs associated with flooding and storm damage. 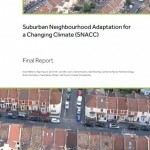 There is no clear process, or delivery mechanism,for adaptation and/or mitigation at the suburban neighbourhood scale. 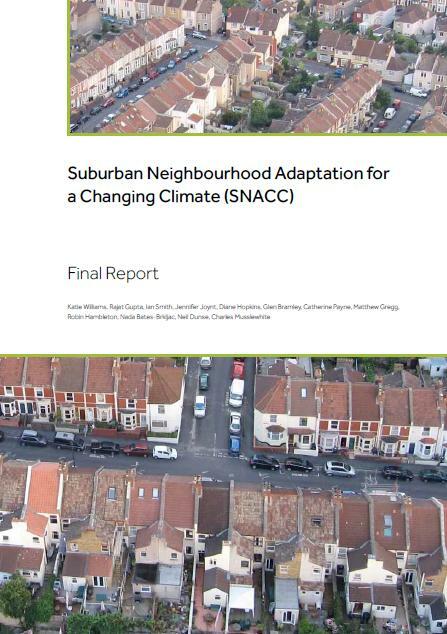 Download the report from the Suburban Neighbourhood Adaptation for a Changing Climate (SNACC) website here. a London-specific target under the Government’s forthcoming Energy Company Obligation (ECO) programme; progressing in achieving the Mayor’s Hydrogen Powered Vehicles strategy; the provision of energy efficiency support to SMEs in London; work being undertaken under the Mayor’s Decentralised Energy Project Delivery Unit; support for Cooperative Renewable Energy projects; how London will benefit under Energy Company Obligation (ECO); a list of all current Decentralised Energy projects supported; the roll out of the Green Deal in London; work to support the support the non-domestic Green Deal programme in London; the scale of the Mayor’s Green Deal programme in London; Guidance on low carbon cooling systems; low/zero carbon measures secured through the GLA’s planning process; GLA review of the potential for low and zero carbon microgeneration technologies; future carbon emissions related to new infrastructure projects; work by the GLA with ICLEI, C40 and Eurocities on climate mitigation and adapation; and update on Low Carbon Skills Forum; planned budgets for future carbon mitigation programmes; carbon savings achieved by the Mayor’s programmes; the success of the Feed in Tariff (FIT) programme in London; an update on the London Thames Gateway Heat Network; the publication date of the Mayor’s Technical Guide for District Heating; and progress on the development of district heating commercial templates and a London Heat Charter. Planning guidance on sustainable design and construction; progress under the RE:FIT programme; targets under the RE:NEW 2 programme; annual progress report on the Mayor’s climate programme; an update on the London greenhouse gas inventory (LEGGI). Publication of the London Environment Strategy (see here for the answer referred to); the number of Solid Wall Insulation companies in London; Mayoral action on tackling Fuel Poverty; energy efficiency of new homes in the Olympic park; proposal for a zero carbon development around the Olympic site; energy consumption of superfast broadband; and future plans for Edmonton incinerator. A series of questions (below) were asked in relation to RE:NEW – all of which were directed to a question asked earlier this year pointing to the November 2012 publication of the evaluation of the RE:NEW programme. How many pensioner households treated under the RE:NEW programme; number of solid wall homes treated under RE:NEW; fuel poor households treated under RE:NEW; flats treatedunder RE:NEW; private rented homes treated under RE:NEW; the number of solid wall installations undertaken under RE:NEW; the number of cavity wall insulation installations undertaken under RE:NEW; the number of loft insulation installations under RE:NEW; the number of benefit checks undertaken through RE:NEW; and how RE:NEW has helped drive up the CERT and Warm Front programmes in London. A total of £102,024,574.64 in FIT payments were due to generators in the quarter 1 April to 30 June 2012. 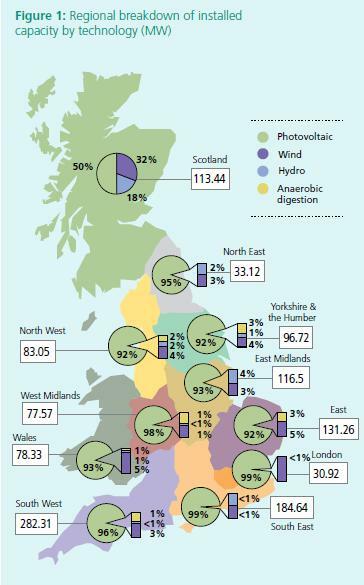 The newsletter includes a figure (above) providing a regional breakdown of generation (in megawatts/MW) across the UK and clearly shows that London has the lowest installed capacity of FIT capacity at only 30.92MW. 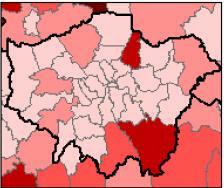 Compared with the highest region, the south-west, London has less than 1/8th of the capacity installed. Download the FITs latest newsletter here. October 2012: BusinessGreen article highlighting that “Green groups have today warned that planning reforms that the government predicts will encourage billions of pounds of new investment in energy projects “totally ignore climate change”. It includes provisions to make it easier for utilities to change designs mid-project to incorporate new energy-efficiency technology with out having to restart the planning process…” Read the full story here. The Department for Communities press release can be viewed here and a background note to the Bill can be downloaded here and the actual bill here. Friends of the Earth have issued the following news release. 17 October 2012: Over 100 people came together in Islington’s Assembly Hall for the End Fuel Poverty Coalition’s Local Action for Warm Homes event. The aim of the conference was to show how councils, working with the End Fuel Poverty Coalition, can play a central role in helping the Government meet its statutory target to eliminate fuel poverty (as set out in the Warm Homes and Energy Conservation Act 2000). 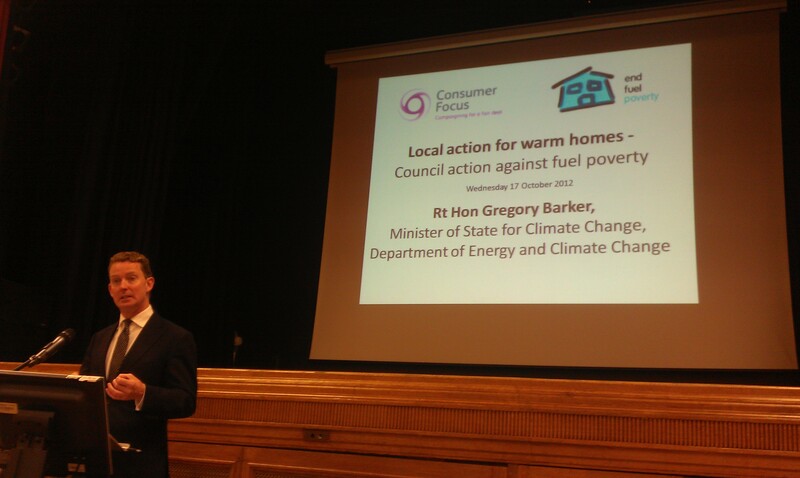 Energy Minister Greg Barker MP addressed the audience on current Government action to tackle fuel poverty. DECC had no specific solutions on tackling fuel poverty issues in London as yet – but the department has a good working relationship with the Mayor and that they would be following up on options following the conclusions of the current fuel poverty definition consultation. 16 October 2012: The Mayor’s RE:NEW domestic energy efficiency programme has just tweeted that it is delivering again across London. Further details on how you can save “up to £300 a year on your energy bills” on the following link.